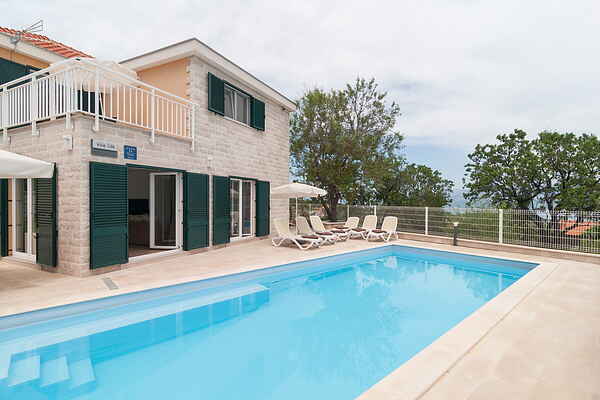 This beautiful Villa provides comfortable accommodation for 6 people in 135 m2 of internal space and 100 m2 of terraces. From the living room there is an open passage to the terraces and pool. It is built in traditional dalmatian architectural style, and the basic material used in external decoration is famous Brač stone, while the horticulture decorated with traditional plants and lawn. In front of the villa are two covered parking. Villa is build on two floors. Ground floor: kitchen, dining room with a large table, living room (40 m2), 1 bedroom (12.5 m2) with bathroom and shower (5 m2) and separate toilet (4 m2), outdoor terrace with sundeck 100m2. Floor: 2 bedrooms (18 m2 / 17 m2) and two bathrooms with showers (5 m2 / 7m2), 2 terrace (11.5 m2 / 6m2). Outdoor pool 4 x10, 40 m2.